SANTA CLARA, Calif., (January 18, 2019) – Leading interactive entertainment media publisher and developer BANDAI NAMCO Entertainment America Inc. is pleased to announce that ACE COMBAT™ 7: SKIES UNKNOWN is now available for purchase in the Americas for the PlayStation®4 computer entertainment system and Xbox One with the PC via STEAM® version arriving on February 1, 2019. Developed by BANDAI NAMCO Entertainment Inc.’s internal Project Aces development team under the leadership of veteran ACE COMBAT Franchise Director, Kazutoki Kono, ACE COMBAT 7: SKIES UNKNOWN marks the franchise’s return to the front lines of the video game marketplace. Placing players in the cockpit of the most advanced war planes ever developed, ACE COMBAT 7: SKIES UNKNOWN delivers a fierce aerial combat experience through photorealistic visuals, intense dog-fighting action, a multitude of authentic and futuristic aircraft, and a highly immersive storyline. PlayStation®VR owners are treated to an exclusive VR mode featuring additional missions and content. 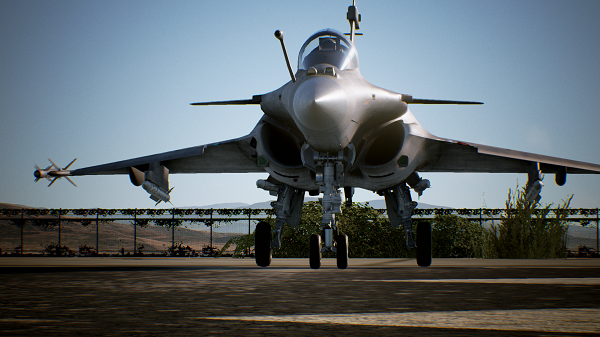 Developed utilizing Unreal Engine™4, ACE COMBAT 7: SKIES UNKNOWN delivers detailed graphics and physics sure to impress new and returning players. Beautifully rendered cloud-filled skies featuring dynamic weather and highly detailed cityscapes enhance the sense of high-performance flight and unparalleled speed, setting the stage for the most engaging aerial battles in the franchise’s 20+ year history. ACE COMBAT 7: SKIES UNKNOWN brings to bear an arsenal of ultra-modern super weapons for players to use against throngs of formidable enemies and over-the-top boss battles – a feature the series is famous for. Aces who have proven their combat prowess in ACE COMBAT 7: SKIES UNKNOWN’s Campaign Mode can take their dogfighting skills online for furious multiplayer battles with up to eight players in both team deathmatch and regular deathmatch games. PlayStation®4 players will be further immersed in ACE COMBAT 7: SKIES UNKNOWN’s realism through exclusive features developed specifically for the Sony PlayStation®VR which includes three VR combat missions, an Airshow Mode where players choreograph their own airshow, and a Hangar Mode which enables players to walk around and view fighter planes up close in a virtual hangar. ACE COMBAT 7: SKIES UNKNOWN is rated “T” for TEEN by the ESRB. The game is available now in the Americas for the PlayStation 4 computer entertainment system and Xbox One. The PC version of the game will be available via STEAM on February 1, 2019. To learn more about ACE COMBAT 7: SKIES UNKNOWN, head over to http://www.acecombat.com. To find out more about BANDAI NAMCO Entertainment America Inc.’s other products, please visit: http://www.bandainamcoent.com/home.html or follow us on Facebook at https://www.facebook.com/BandaiNamcoUS or join the conversation on Twitter at https://www.twitter.com/BandaiNamcoUS. BANDAI NAMCO Entertainment America Inc., part of BANDAI NAMCO Holdings Inc., is a leading global publisher and developer of interactive content — including all major video game consoles, iOS, mobile and online. The company is known for creating and publishing many of the industry’s top video game franchises, including PAC-MAN®, TEKKEN®, SOULCALIBUR®, NARUTO™, NARUTO SHIPPUDEN™, Dragon Ball®, GALAGA®, RIDGE RACER® and ACE COMBAT®. More information about the company and its products can be found at www.bandainamcoent.com or www.facebook.com/BandaiNamcoUS.